You want to travel to the other part of the world. Of course, the fastest mode of transportation is choosing airlines. But, do their data processing systems as fast as their flights? Don’t think so? The waiting times one needs to bear before check-in and while checking out, customs clearance, flight delays, and many other problems still make the rabbit appear as a tortoise. To curb out all these problems faced by the aviation industry, experts have a simple suggestion. What is it? Integrating their systems with blockchain to make the process efficient. But what about the hype about blockchain going rounds on social media and in tech meets? 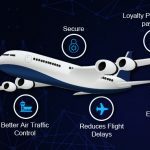 Blockchain has the potential to live up to the hype and will dramatically help improve operational efficiencies in the airline industry. With blockchain fever taking over the world, Singapore airlines already adopted blockchain to issue loyalty points to its users which can be converted to air miles. Singapore Airlines is a type of early adopter which makes hay while the sun shines. It’s hard to forget the Equifax hack which made our personal information severely vulnerable to online attacks because of the storage in central servers. Blockchain’s promise in identity management should be seen with sharp eyes because there’s definitely something which is worth looking at. In Airlines, managing identity with passports can be much better. By completely eliminating paperwork, like carrying passports, Visa and other documents can be eliminated by evolving in managing user identities with blockchain. This helps eliminate many inefficiencies faced in airports. 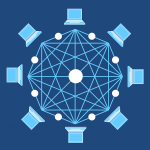 Simply put, the distributed ledger technology, if enabled in the airline, will take care of the payment systems when cryptocurrencies are enabled as a payment method. Travelers don’t need to carry chunks of dollar bills to exchange it in airports and while paying for their tickets. Singapore Airlines’ adoption of blockchain technology to issue loyalty points powered by the digital blockchain wallet called Krispay is a clear indication of welcoming blockchain in Aviation Industry. Frequent fliers will be included in the program “KrisFlyer” which lets the flyers spend their air miles at partner merchant locations such as petrol pumps, retail establishments, etc. Bitcoin, the first ever blockchain application is accepted as a payment method along with Ethereum, Dash, Bitcoin Cash and a few other altcoins in Brisbane International Airport. The Airport’s strategic planning General Manager has stated that a lot of travelers are making money investing in cryptocurrencies and those people often travel internationally. So accepting cryptocurrencies as a payment method in airports totally makes sense. Are you a frequent flier? Then you must have known this and felt this. The voice which announces flight delays is the only thing which you avoid to hear. It’s because you may have to catch a connecting flight or reach the destination on time to attend a meeting or conference you can’t afford to miss. But, flight delays are inevitable until the adoption of the blockchain. What makes the flight delays? The reasons include security clearances, waiting for connecting passengers, their baggage, loading and unloading cargo, weather, mechanical delay, waiting for the crew, weight restriction, catering, and airport congestion and on and on and on. While blockchain may not put an end to all the reasons while delays the flights, but it can make the processes much faster. How? By distributing the ledger containing data and information about the passengers and aircraft’s security details, it’s much easy for the officials to clear securities of the flights thus enhancing processing speed. Connecting passengers and their baggage will be moved on time as the blockchain reports data effectively compared to the traditional systems. You may ask, for natural calamities what does it do? 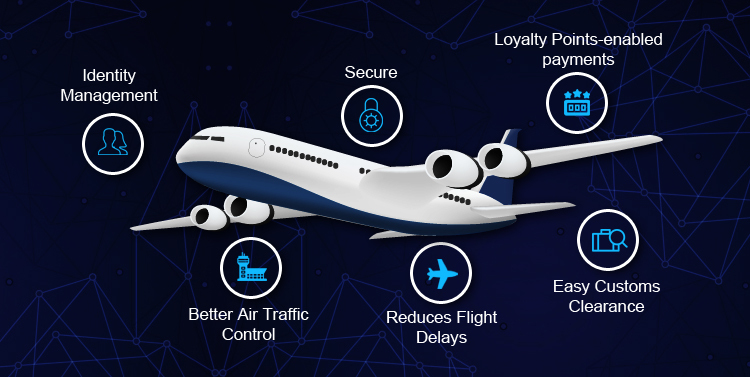 By enabling IoT devices which have the capability to sense and report weather conditions of various airports and traveling path of the aircraft. So, the experienced pilots and crew members will be updated and so the travelers in real-time about the upcoming storm or rain or fog so they can plan accordingly. Nothing annoys more than hearing the excuse of aircraft maintenance when the flight is getting delayed. Almost nobody likes it. But the crew needs to maintain a checklist of things which needed to perform before taking off. Flight operations such as checking the functions of aircraft components, engines, monitoring overall performance and a few others needed to be done by the crew and it’s a totally time-consuming process. Since those processes should be treated with great significance, enabling IoT devices to do the job can effectively make the process much easier by sharing those data in a blockchain. While the Air Traffic Controllers are making a good job in making the flights don’t collide with each other, managing the airport congestion is always their worst nightmare. If it happens to be a flight which gets stuck in runway due to some technical issue, then all hell breaks loose. While their eyes are busy on the sky (Air Traffic Control Systems), they should always take a note of what’s happening on the road (Runways). If managing more aircraft in busy airports, ATC systems often become slow and there are inefficiencies in reporting problems early. 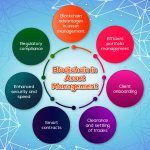 Blockchain may put an end to this problem by not only making the Air Traffic Control systems faster but also distributes the data and information about aircraft and other technical details which are served across airports. So, the next time, the road is endless for an Air Traffic Controller if it is blockchain-enabled. What did I just say? Not the road. Sorry, with blockchain, the sky is endless for an ATC. 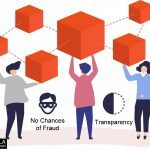 While the prominent feature of the blockchain is to eliminate fraud and enhance security, blockchain enables trust between the parties. This stand-alone feature will connect the travelers, flight operators, airports, crew members and air traffic control and establishes trust between them. This makes the blockchain the best ally for airlines. When’s the last time you or your baggage was held by Customs department? If not, then you must be very lucky. Despite submitting valid proof of documents, it takes really an awful lot of time to get customs clearance. This operational inefficiency keeps cargos waiting in the customs for a very long time. They may check the goods for authenticity, and check whether the duties are paid according to local laws and a lot other checklists needs to be checked before handing over the cargo or baggage. Blockchain enforces efficiency by recording all the transactions happened with the particular cargo or baggage at the origin location along with the security documents, thus eliminates the need to recheck the valid documents. Since the transactions in the blockchain cannot be forged, this enables the trust of moving a cargo from a country to another. Suppose, you record the transaction of paying the duties for moving cargo or a baggage, it is easy to get a customs clearance just by looking for those particular details in the blockchain. This eliminates the tedious tasks performed by the customs department. 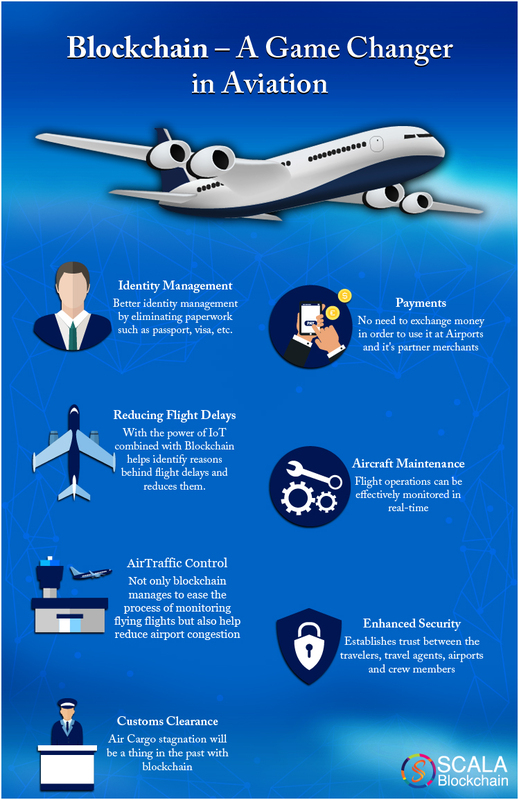 Don’t you think that the blockchain’s combination with aviation industry is a game changer? 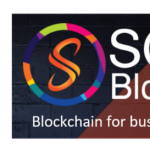 Scalablockchain is a technology partner to build better aviation systems using blockchain technology. Let’s bring the travelers, airports, air traffic control, crew, aircraft and the travel agents together to make the systems faster and let the faster rabbit win instead of the sluggish tortoise. Come on; feel free to talk to us. We love discussing blockchain.